Even though it’s September now, and the Autumn/Winter collections are making the rounds here too – it’s still summer as far as I’m concerned. On Saturday my makeup melted off my face within 10 seconds of setting foot outdoors, and today my snazzy Pantone 5 tells me it’s 34 degrees Celsius outside. There’s no way in hell. It must be 40 or 100, or whatever the temperature of a sauna is; because, with the humidity clocking in at 70%, a sauna is exactly what it feels like, turning me into a sweaty, sticky, irate mess. A charming portrait I’ve just painted of myself, I know. Having left the school to buy my daily sandwich, I decided I deserved something nice to stave off the natsubate (or summer fatigue if you will). Whether I really suffer from it, or whether I am just using it as an excuse to buy what I love – ice cream – will forever remain a mystery! 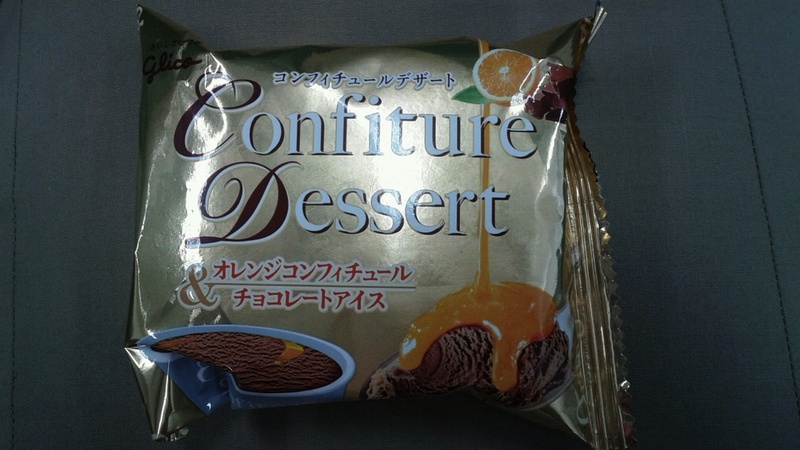 I took a gamble on this chocolate-orange flavoured Confiture Dessert by Glico, which I bought at Family Mart. 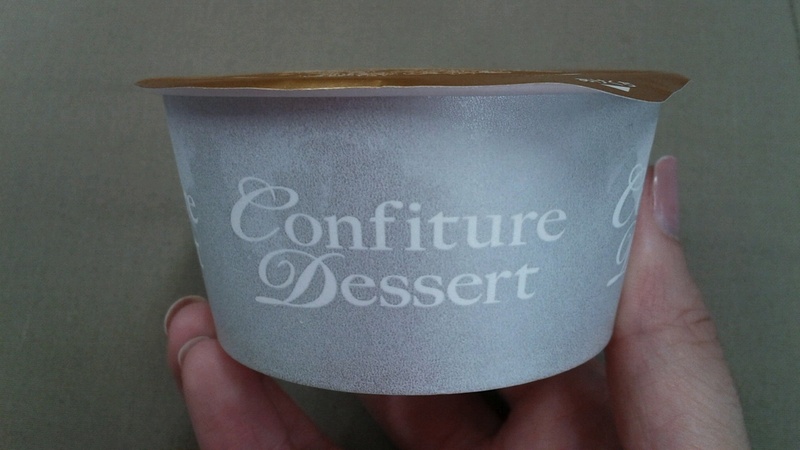 It sounds insane, but it’s just ice cream. I’d never seen it before, and much as I love chocolate on its own, I’m a sucker for mint chocolate as well as orange chocolate flavours. And… drumroll… it was SO good! It tasted like a Terry’s Chocolate Orange! Except that it was ice cream! 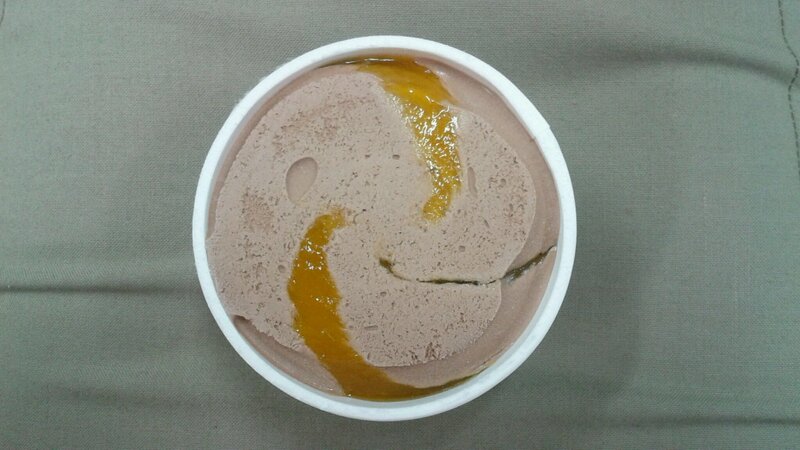 Chocolate ice cream with lashings of orange sauce! Mmm, heaven! Sorry about all of the exclamation marks, I got just a little bit carried away there. If you’re in Japan and you see this, pounce on it! It’s lovely, and the perfect cure for the dreaded natsubate, in my humble opinion. I even ate it before my sandwich – naughty! 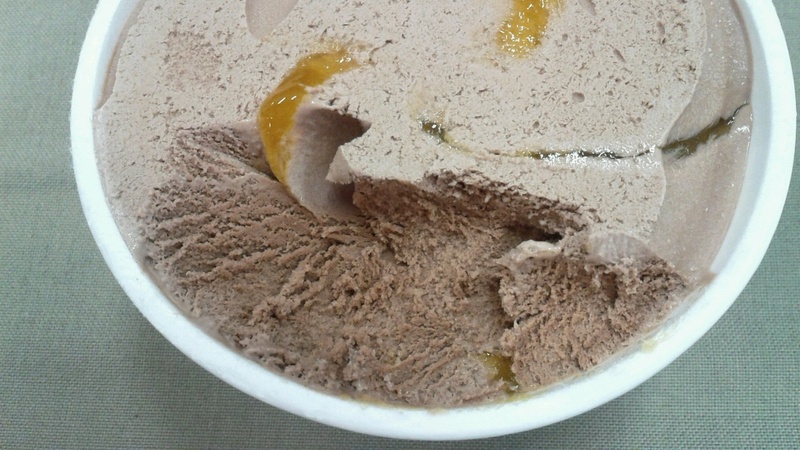 It’s definitely still hot enough for ice cream 🙂 I love orange-chocolate, too! Looks so good! Uhg, I feel you on the heat. Summer might be over, but it’s heat is still lingering. That ice cream looks really good for a hot “fall” day.